Last week I taught a five day whitewater immersion course on the Trinity river. It was so nice to have the same group of students for an extended period of time while staying on the river - they learned a lot more, the group bonded together and it was like a vacation every night in camp. And with the full moon and beautiful scenery it gave me a chance to get some great PICTURES. I love my Lumix camera but it doesn't have the full SLR range and versatility so getting good moonlight pictures takes a lot of work. It ends up being a lot of guess work on how things will turn out and a lot of unfocused pictures. But when it works it's pretty cool. After the Trinity trip we drove straight back to Coloma to start a two day Whitewater 201 class. It's not quite the same but it's fun to be teaching back 'at home' where the flows are down to their normal perfect (for teaching) summer levels. Then I get to go paddling for a few days (trying to put together a multi-day trip somewhere in the sierras). Then hopefully some more teaching and some more paddling. I'm going to see if I can get two solid weeks in a row with being on the river every day. 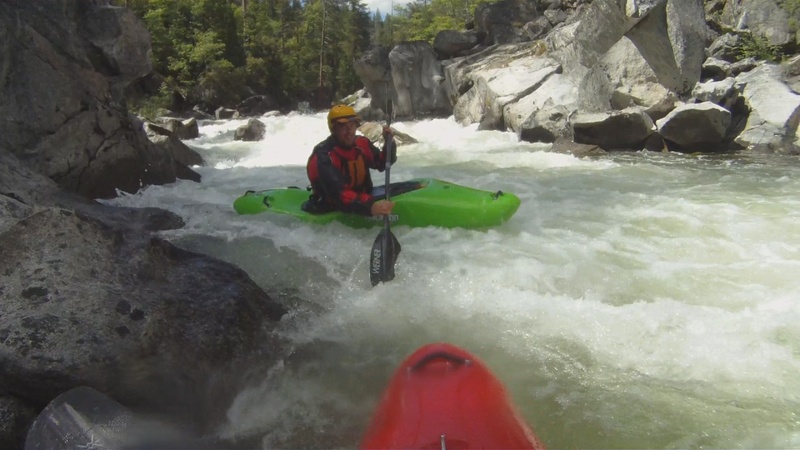 Last week a friend from SoCal headed north and we met up for several days of whitewater kayaking. He has a real job and was taking a week's vacation. And while kayaking is my job, I also was looking forward to the chance to spend a week boating for fun and hanging out with my friend - a vacation of sorts. The main goal was to relax; get away from the stresses that go with any job and just enjoy the river. We planned to start paddling near Yose mite and head north depending on what rivers had the best flows. We started on the South Fork of the Tuolumne a little ways outside Groveland. We had never done the run but a new gauge has been installed and was reporting an optimal flow. After setting shuttle at the take out my friend suggested we drive a little further past the normal put in and float an additional couple of miles - he used to work at a summer camp in the area and was sure it would just be a simple float through mellow water that would only add an hour or less to the day. Sure. No problem. And the river started out exactly as described. We had to avoid several fallen trees but the river was slow and gentle so it wasn't too bad. After about a mile we came to a little slide; and then to a bigger slide entering a granite lined gorge. We got out to scout and I decided to scout a little further to see what the gorge had to offer. After the initial slide there were a couple small drops before the river crashed down a 30' waterfall slamming into a wall. OK, we could walk around that. But below it were more big drops, most of which had rocks in all the wrong places. Eventually we found an even larger waterfall that crashed into several boulders. In the end we ended up just portaging the boats around every drop in the gorge for almost a mile. A mile of scrambling along smooth granite slabs and crashing through poison oak, roping the boats around cliffs and sweating fiercely in the summer heat. It took over three hours to complete the portaging and we got to what was supposed to be our starting point just before dark. After hitching/hiking to retrieve our vehicles we made it to town just in time to order a pizza from the only place that was open before heading back to crash at camp. The next day we decided to just do the normal run. But after getting my boat pinned early on in a shallow channel I tweaked my knee climbing out. From then on the river was my nemesis: rocks in bad places, wood blocking good channels, trees blocking visibility and a reluctance to run anything risky. So a second slow day brought us to the take out near dusk and settling for pizza at the end of another exhausting day. So far there was little rest and relaxation happening on this vacation. So we decided to move up to a different river - the North Fork Stanislaus. This was a much friendlier river and a perfect day on the water. So feeling a little encouraged we decided to try to get up to do Mil l Creek, a two day trip coming off of Mt. Lassen that I had done last year. After a fair bit of time on the road (and a night crashing at my place in Folsom) we made it to the takeout and hooked up with the local shuttle service to drive us up to the put in. We got a late start but cruised down the river to make camp by 5pm. We finally got a chance to sit and relax in nature and enjoy a warm California evening under the trees. It finally felt like a vacation. After finishing up Mill early in the afternoon we had the choice of trying to squeeze in one more river the next day. But my friend had a long drive to get back to LA and quite frankly we had had enough. We got in some tough paddling, some fun paddling, and a little relaxation. It was time to call it a vacation and get some rest before heading back to work. Who wants to learn something? I just got back from several days of river paddling and I'm working on editing the video. I am also working on an article I'm writing for California Kayaker Magazine. It's about paddling with current, be it in the river or ocean. I have a draft completed and was thinking that this would be a great audience to get some feedback from. It's missing some photos and diagrams that I am still working on but I think you can get the idea. Please let me know what you think and if you like it I can post some more technique articles I'm working on. Moving water comes in many shapes and sizes and learning to paddle with current can open up more options for paddlers in any boat. Whether you are on a river or tidal flow, in a long boat or short, there are some simple principles to understand and basic techniques that will allow you to negotiate the moving water safely and efficiently. 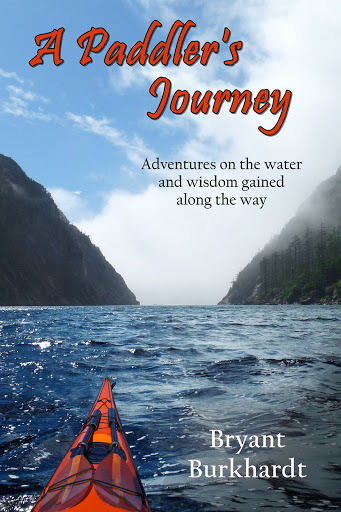 I began my kayak career on the ocean so when I got around to paddling on the river I already had some basic skills – I could paddle in a straight line, edge my boat a little and even pull off a combat roll. But my lack of understanding of currents meant I used that roll a lot, constantly being flipped by water for no apparent reason. This was because I did not understand the fundamental nature of how moving water interacts with a kayak. Understanding some basic hydrodynamics will go a long way to allowing you to avoid the upside down learning process. The first thing to understand is that moving water is only important in a relative context – if a boat is moving the same speed as the current then the interaction between boat and water is exactly the same as if both are stationary. It is when there is a difference in speed or direction between the boat and water that the dynamic interaction of the two comes into play. This occurs when a boater is moving from calm water (eddy) into current or vice versa. That transition is the critical moment and we will look in depth at how to handle it. But first let us look at what happens when moving water hits a stationary boat (which is the same as when a moving boat hits stationary water). If the water hits the boat head on then nothing much is going to happen. The bow (and generally the stern) of a boat is designed to split the water. So the water will be smoothly separated and flow around the boat causing the paddler no concern. But when the water hits the side of the boat it cannot simply go around – the obstacle is too large. In this case the water will pile up on the upstream side of the boat, and this resulting pile of water will catch and push down on that side of the boat causing a twisting force that wants to flip your kayak upstream. This is the cause of the majority of flips when learning to paddle in current. Now let us look at that same situation with current hitting the boat – but instead of a flat boat let’s see what happens when the boat is edged downstream (you can also think of this as lifting the upstream edge). To be clear: I’m talking about changing the angle of the boat on the water, not leaning your body - just the boat. Now the moving water does not run into the side of the boat first, it actually hits the bottom of the boat. Instead of piling up on the side of the boat the water is pushed under the boat. This action will actually push up on the downstream edge of the boat in an attempt to flatten the boat out. This righting force from the water is easily countered by the boat lean that created it and when the two forces are in balance the boat and paddler are quite stable. 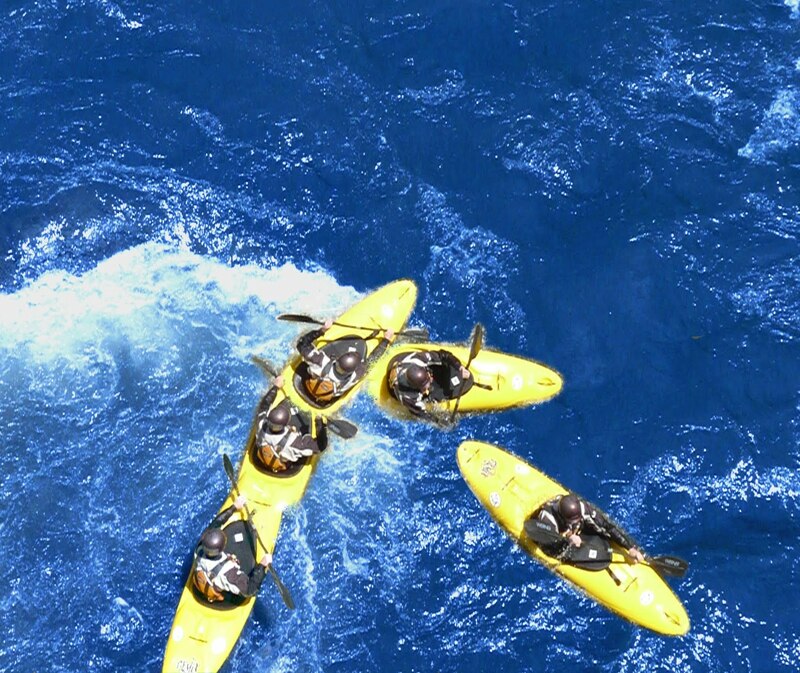 So understanding how and when to edge the kayak when entering or leaving currents is the key to dealing with moving water. Now that we know that edging is the key and the transition between currents is the critical moment we shall look in detail at how to accomplish this action. The technique is called an Eddy Turn and it is used to go from an eddy into current or from current into an eddy. And to be clear: when I say an eddy I simply mean water that is moving at a different speed from the main current. And the division between the eddy and the current will be referred to as the eddy line. Often eddies appears to be totally calm water but many times the eddy will have a current that is opposite in direction to the main current. Again, the important thing is always relative motion and this technique applies to any transition from water moving at one speed to water moving at a different speed. We will start with the most common situation and then see how that can be generalized. We will begin in an eddy next to shore with calm water and our goal will be to get our kayak out into the moving water that is going by (be it a river or tidal current). Once we are out in the current and moving at the same speed as the water then it is just the same as paddling on flat water. Only when we look to exit the current and stop in an eddy do we have to again pay attention to current specific techniques. To enter the current from an eddy one could theoretically just paddle straight into the current. The problem is that when your bow hits that current it will start to turn the boat and since the rest of your kayak is still in the eddy your boat will be spun around before you can cross the eddy line into the current. The solution to this is to start out pointed upstream into the current. While the current will still turn your bow downstream this initial angle will give you more time to cross over into the current and get up to speed while being less likely to spin around and end up where you started. This turning action leaves us pointed more or less downstream and is why we call it an eddy turn and not an eddy cross. 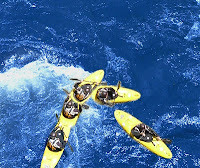 But the current does the turning of the kayak – you don’t need to use any turning strokes to accomplish this. Another important component to crossing the eddy line is speed. The eddy line itself is not always a thin, straight line. The area between the eddy and the current can be several feet wide and quite turbulent. We want to get through such an area as quickly as possible so we want to have as much forward speed as we can going into it. This speed will also give us more momentum which helps to stabilize the boat throughout the eddy turn. Finally we get back to where we started: we need to edge our kayak as we cross the eddy line and enter the current. From our earlier discussion this edge will prevent the current from catching the upstream side of the boat and flipping it. So we need to edge downstream (lift the upstream edge) as we cross the eddy line and hold that edge throughout the turn. If you drop your edge too early the water will pile up and flip you, whereas if you hold the edge too long there is no penalty. So just keep that edge. It is important to note that this downstream edging throughout the turn is just like leaning into the turn on a bicycle (or skis or surfing or any other sport). So we have completed our eddy turn and are now in the flow of the current. Once we decide to pull out into an eddy we will use the exact same technique. We just have to look at the relative water speed and adjust accordingly. When you are moving with the current the eddy’s calm water appears to be moving in the opposite direction. Now you need to angle down into the eddy, get up some speed and edge away from that eddy current (once again this is simply leaning into the turn). These are the three keys to performing an eddy turn: Angle, Speed and Edge. You need all three to be present in order to make a stable transition from water moving at one speed to water moving at another. For faster, stronger currents you will need to increase all three of these: higher angle, more speed and more edge. Each situation has its own perfect combination but after a little practice it will happen naturally (just like riding that bike). After what seemed like an cold and snowy spring that would never end we have finally headed into summer. With temps up close to 90 the snow has started melting and the rivers are all raging. Teaching over the weekend on the SF American was a whole new challenge. Can we find some flatwater to practice in? Are there eddy lines that won't whiplash the students? If someone swims can we get them to shore (with their gear) before we end up in the lake? I'm happy to report that everything worked out and combining my two guys with Laura's two gals made for a fun time. Now the reason that the South Fork was so high is because Slab Creek Reservoir is spilling. That means the Slab Creek run is in. Last year Slab Creek only ran for two days and I was lucky enough to get on it both times. Well, I missed the first day this year but got it the second (though it now sounds like it will be going for another week). It is such a fun run and has so many good things going for it: just outside Placerville, outstanding granite scenery, consistent class IV+, no portages and no big hazards. In the future we should get releases on Slab under the new re-licensing of the dam, but there are some hurdles before that happens. In the mean time we will have to be content with short windows during peak runoff or the random rain storm spill. If I paddle for the rest of my life I may never get on all the runs I would like to do in the Sierras. But it's a fun goal to shoot for. The other day I completed a step on that Journey - after doing the North Fork Mokelumne I have done at least one run in every major drainage: Kern, Tule, Kaweah, San Joaquin, Merced, Tuolumne, Stanislaus, Mokelumne, Cosumnes, American, Bear, Yuba, Feather. One of the best parts of whitewater kayaking is exploring a new area - literally not knowing what is around the corner. The NF Mok (Devil's Nose) was a great day and afterward I drove up a little further to find that just upstream is where the incredibly scenery starts (and where the Fantasy Falls run ends). I had no idea it was quite so picturesque in this little drainage. I was also trying out my new boat - I got my Jackson Villain S last week but was teaching over the weekend (w orks for that as well) so I was excited to get a better chance to really see how it handles. I've been paddling the Rocker for the past three years and while I love the boat for it's forgiveness and ability to shrug off most anything it definitely loses something on big water runs. The Villain paddle a lot like an improved Rocker - same general forgiveness but with some edge to steer better and a little faster. Before the Mok we hit Kyburz - both have a big water feel and the Villain really responded well. It will take a little more before I have it dialed in but I think I'm going to be really happy.